85 Cake. Carolina Cake. Mrs. Matson. 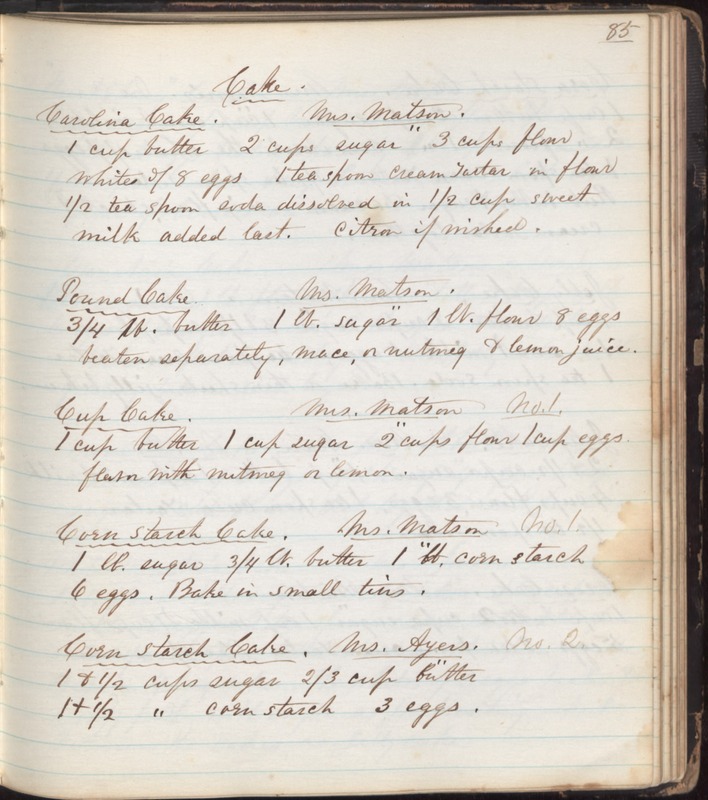 1 cup butter 2 cups sugar 3 cups flour whites of 8 eggs 1 teaspoon cream tartar in flour 1/2 tea spoon soda dissolved in 1/2 cup sweet milk added last. Citron if wished. Pound Cake. Mrs. Matson. 3/4 lb. butter 1 lb. sugar 1 lb. flour 8 eggs beaten separately, mace, or nutmeg & lemon juice. Cup Cake. Mrs. Matson. No. 1. 1 cup butter 1 cup sugar 2 cups flour 1 cup eggs flavor with nutmeg or lemon. Corn starch Cake. Mrs. Matson No. 1. 1 lb. sugar 3/4 lb. butter 1 lb. corn starch 6 eggs. Bake in small tins. Corn starch Cake. Mrs. Ayers. No. 2. 1 & 1/2 cups sugar 2/3 cup butter 1 & 1/2 " corn starch 3 eggs.